Let’s continue with the Indian theme. Last week was pork vindaloo. 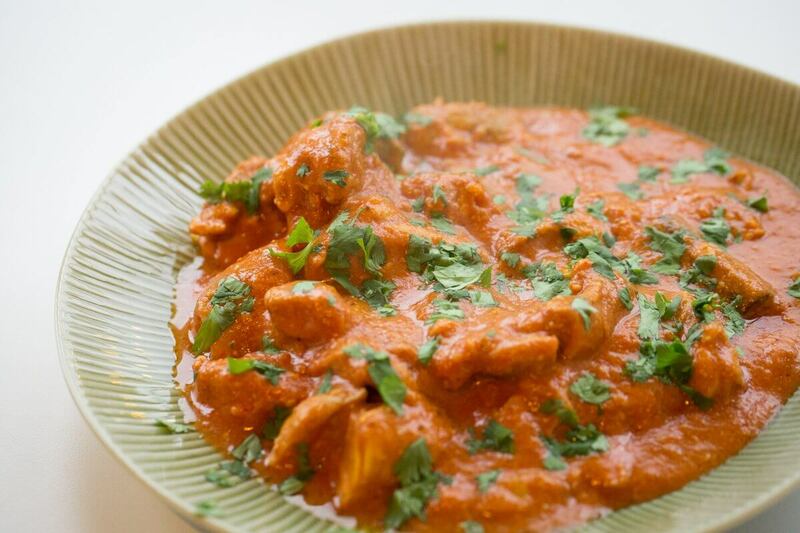 Butter chicken is an Indian takeout/buffet staple. Everybody has their favourite butter chicken. My go-to Indian recipe, Easy Indian Cooking, doesn’t have a butter chicken recipe. So I ventured online, which is always risky. You never know the quality of the recipe you’re going to find. The recipe is straightforward: cook some onions, add some spices, add tomato purée, a few more ingredients, then the chicken until cooked through and the sauce is thickened. Add a few more spices and cream or cashew purée (I used cream). Garnish with fresh coriander and serve! While this wasn’t the best butter chicken I’ve had, it certainly satisfied a craving. But I’ll still be on the lookout for the perfect butter chicken recipe.